Heart-shaped bokeh is a popular photography trick for Valentine's Day or any time you want to show a little extra love in your photographs. 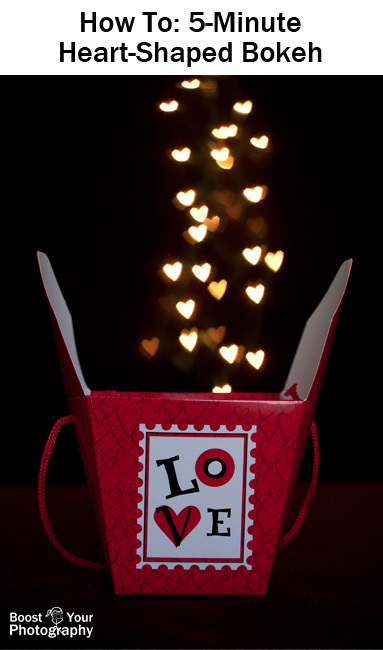 All you need is five minutes and a few basic supplies, and you can be shooting heart-shaped bokeh. 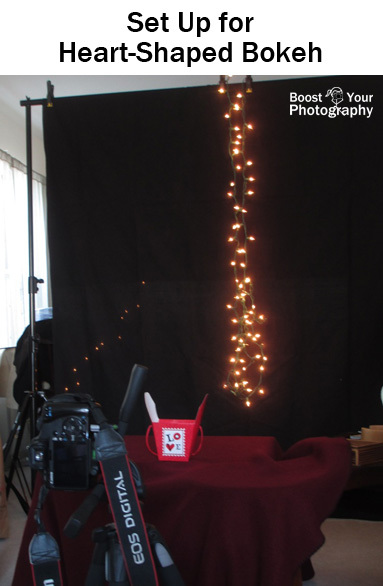 You could always buy a shaped-bokeh kit, but why bother when you likely already have all the supplies to make your own? You can get extra crafty and use an x-acto knife for making the really small cuts, but a sharp scissors works well for cutting both sides of the heart at once. You could even use a heart-shaped hole punch, if you happen to have one. Cut a piece of black cardstock an inch or so thick and long enough to wrap around your 50 mm lens. Roll it around the lens and tape it together. Trace around your 50 mm lens to make a circle. Cut it out, leaving a half inch or so all the way around. Cut notches from the outside into the traced circle, which you will later bend to secure the circle onto the front of the lens. And, that's it. 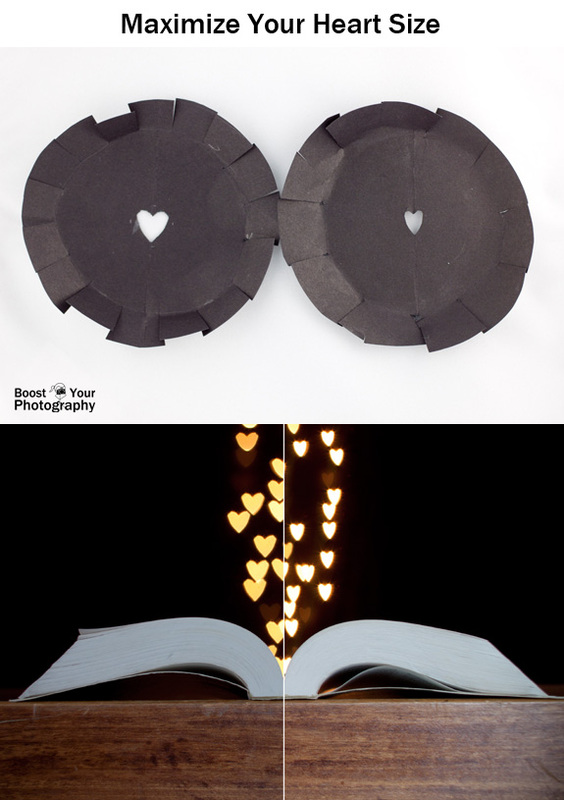 Place the roll over your 50 mm lens, hold the circle with the heart in front of your lens, and use the rubber band to secure the folded flaps around the outside of the roll. Now you need to find yourself a bokeh source, set up your subject, and start shooting. 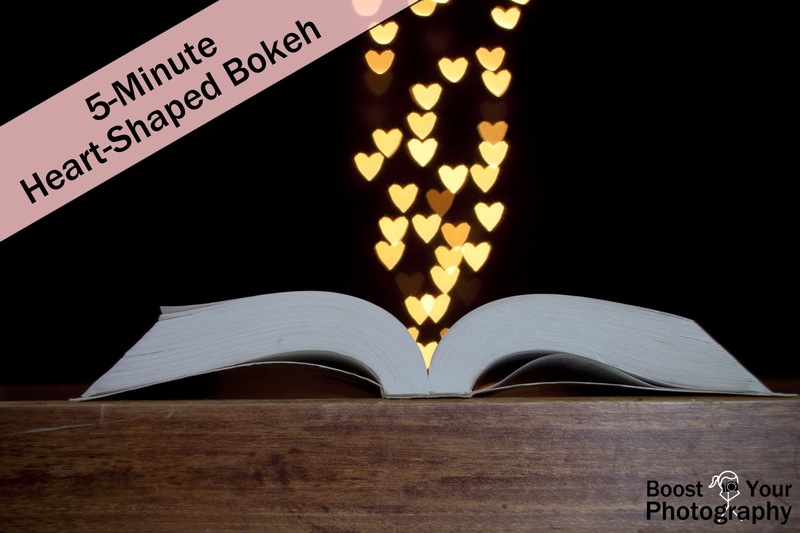 If you need a little more background on bokeh, you may want to click on and read the posts All about Bokeh and Shaped Bokeh for more details and examples of bokeh and how to. Consider using a tripod for your camera. You will be shooting at the widest aperture you can (f/1.8 or faster, hopefully, if you are using a 50 mm f/1.8 lens for example), but putting the heart shape in front of the lens will cut down on the amount of light reaching the sensor and require a longer shutter speed. Shoot in manual or aperture priority, set the aperture to f/1.8 or faster, and work from there. Consider using a flash if you want to illuminate only the subject and leave the background darker. Use a remote or 2-second countdown timer to avoid camera shake on the tripod. You want to get your subject as close the camera as possible, while keeping the background and lights at least twice as far away. The closer-in the camera can focus, the larger the final bokeh hearts will be. You may need to experiment a bit to find the best locations for your given subject. 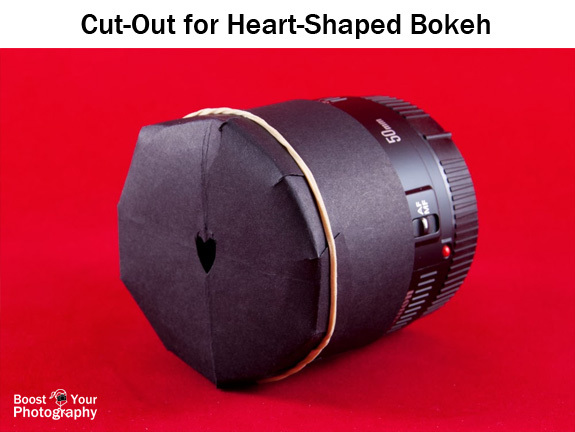 Now you are ready to shoot your own heart-shaped bokeh in five minutes or less. You could create an image for your own Valentine's Day cards or just for fun. You can apply the same ideas to creating other shapes, as well. What will you create? 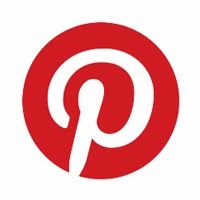 Share a link or picture in the comments below! This post is also linked to Do Tell Tuesday, One Project at a Time, and What I Learned Wednesday.